I’ve had my share of getting ripped off by Garden of Eden, so tonight’s trickery came as no surprise. My guilty-looking cashier asked her colleague the code for my small bag of cremini mushrooms, and I don’t know if she gave her the wrong one on purpose. Needless to say, I was watching the monitor like a hawk, and I piped in, “These aren’t Hen of the Woods! They are cremini!” She gave me a pathetic apology, and I replied that I was used to it. This scares me. What percentage of customers are prepared to argue with these non-English-speaking cashiers over the price of their specialty produce? Ten percent? 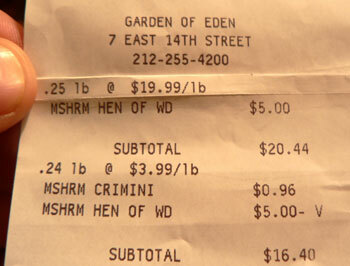 How many people will immediately recognize that “HEN OF WD” is referring to the mushrooms that Garden of Eden is charging them for, when it’s five times the price of the mushrooms they will bring home? Most people won’t even notice that they paid five dollars for a few mushrooms, and I bet this happens at this store fifty times a day. Why do I keep going back, people may wonder. Because I’m addicted to the fabulous food, and because I know enough to not get taken. I tend to avoid that particular Garden of Eden for many reasons, one being the one you wrote about. They also sell dairy products past their prime, even the specialty cheeses, so be careful. But they do have a great olive bar, and their prepped food can’t be beat. It’s good for a cheap lunch too. Jesus. That’s some difference. I’m glad you caught it. I don’t know what I’d do if I found a place I frequented was constantly over charging me. I’d probably speak to the manager and inform them that I planned to speak to the better business bureau unless they could tell me right then that it was an innocent mistake and how they were going to educate their employees to make the problem a thing of the past. 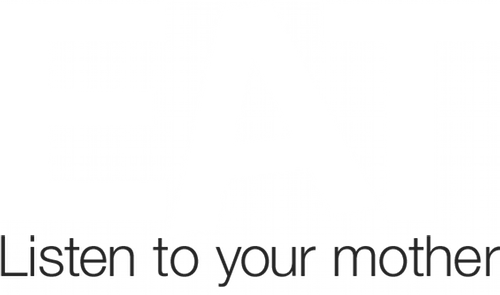 A business shouldn’t get away with something like that simply because it’s the best place to get specialty food. You’re both right. They do have a great olive bar, but they shouldn’t get away with this nonsense! I blame the union. The employees there have had a rocky relationship with the store and even went on strike a year or two ago. In other words, most of them are about as charming and helpful as your average MTA employee. I don’t think complaining will do much good, but I’m sure I’ll do it eventually. Perhaps a letter is in order. Here in Texas we have a chain called Central Market, where we weigh and label our own produce. The consumer is expected to input the correct code and the scale prints a label you attach to the bag. This is a vast improvement over the slack-jawed teenage cashier at Kroger who holds up the fresh ginger and says “what’s this?” then stops to look up the code on his little cheat sheet. That is a better system, Chef Lamb, and one that is widely used in France, much to confusion of Americans. I can’t believe those women were more comfortable identifying Hen of the Woods mushrooms than regular old cremini! Better left to the person shopping. Oooh, a Texan who shops at Central Market! Of all the things I miss about Texas (which aren’t many, mind), Central Market is consistently at the top of the list. The things they try to pass off as grocery stores in Pittsburgh don’t even come close!